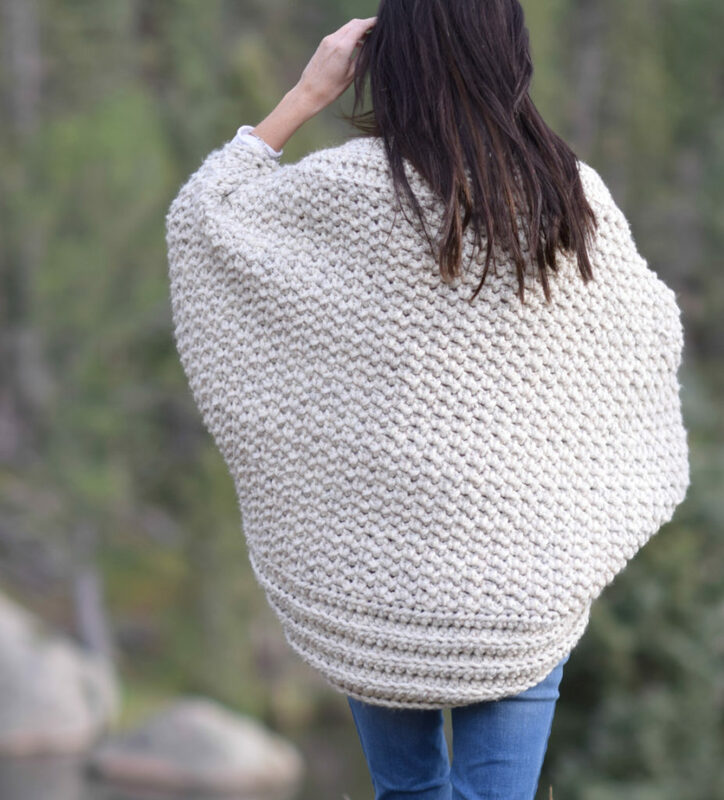 Have you found that sometimes the cocoons and blanket sweaters want to slide right off the shoulders? This is why in most of my blanket sweater designs you’ll find the option to add a button so the darn thing stays in place. I’ve added the optional button with this sweater too, but YOU GUYS, this one doesn’t want to slide off my shoulders. 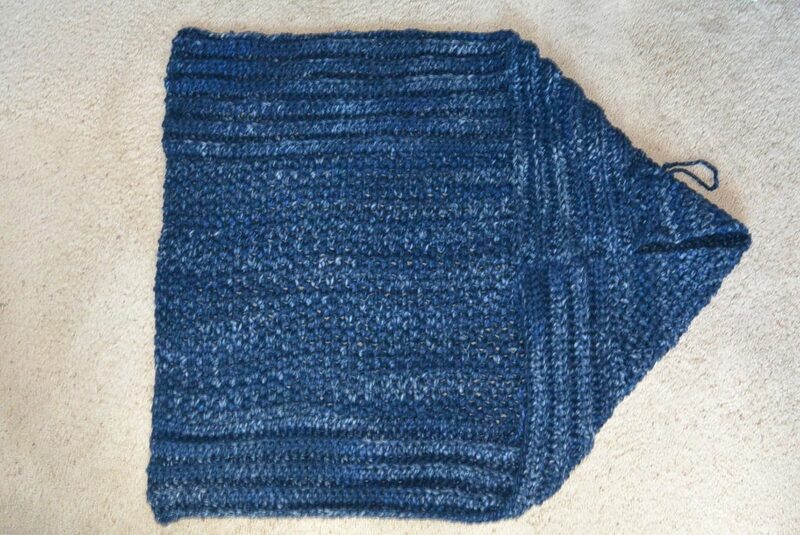 Something about the drape of the fabric, or maybe the texture of the yarn, but it stays put without the button. Win win. As usual, this blanket sweater works up just like a blanket. You will crochet a basic rectangle following a simple stitch pattern, then fold in the corners and seam to create the arms. It doesn’t get easier or more mindless than this. The pattern is also written in a size that will fit most of you. I’ve slapped this sweater on friends of all sizes to test it out and it works! Above you can see that I added a button in order to keep it on the shoulders even better. There’s no need to make a complicated button hole as it will fit right through the fabric. I found that I don’t need the button, but if you’d like that extra security to keep the cardigan in place, it’s an easy and stylish option. 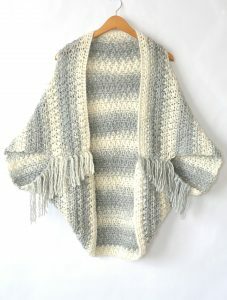 The most comfortable, warm and striking cardigan for any fall or winter wardrobe. 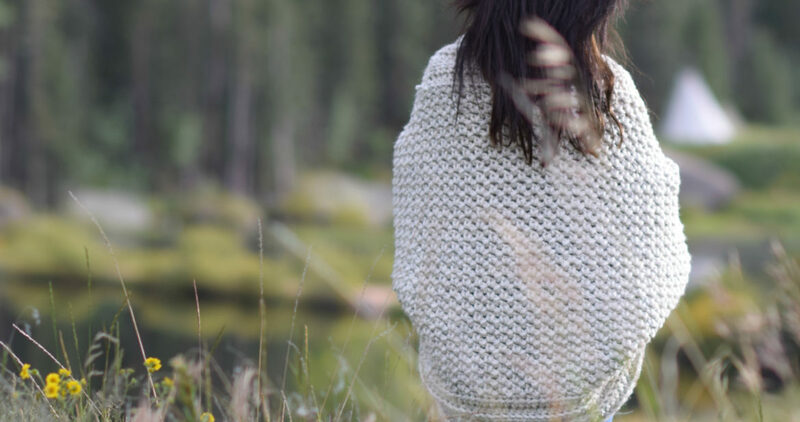 Luxurious chunky yarn paired with the beautiful knit-like stitch pattern is sure to impress and be a piece you’ll want to wear every day. When piece is laid flat on ground, end of arm to end of arm measurement is approximately 40”. Top of neck to bottom of piece is approximately 32”. Piece stretches downward when worn. IMPORTANT: Be sure to check your gauge before beginning. Also, measure after working several rows to make sure that your piece is measuring close to 40” across. Adjust your tension or hook size if necessary. Tie off and weave in ends. Move onto seaming and assembly. Place piece lengthwise on the floor or large table. Fold each corner inward until they meet. With your tapestry needle and length of yarn, simply seam inward with a preferred seam (I used a whip stitch) on each side, leaving an opening for the arms that are approximately 9” long. (Note: You can adjust the seam length to your liking) You may also choose to add a 1 ¼” button to the upper portion of the cardigan. There is no need to add a button hole as it will fit through the fabric. Above: Simply fold the corners inward and seam, leaving holes for the arms. I want to make mine larger, how do I do that? Make your initial chain longer but keep an odd stitch count. You will also have to add more rows to keep the shape correct. Keep in mind that you will also use more yarn than the pattern indicates. What if mine is turning out small? Be sure to check your gauge before beginning. You can also measure after working several rows to make sure that your piece is measuring close to 40” across. Adjust your tension or hook size if necessary. That’s it my friends! PLEASE – I’d love to hear if you make one of these for the cool season ahead. Love this and will be so perfect with this cold weather moving in… looks like 30’s for the nights this weekend!!!! Thank you!!!! I am definitely going to try this pattern. It looks fun, but is there a way to print your patterns without all the ads? They take up so much room, and waste paper. I hear ya-it can be a challenge to print with the ads! The only thing you can do is to copy and paste the specific parts of the pattern (without the ads) into Microsoft Word and print from there. Jessica, you can download “Print Friendly” (free) and then you can delete any parts of the pattern you don’t want. Like the ads!! You don’t say how many ounces are in each skein or ball of yarn that are needed for this wrap. Could you tell me the ounces of each one? Love the Pattern! If you want to save it easily. Left click on the mouse. You can select the pictures and instructions, right click the mouse, copy them to your clipboard and then go to your word software and right click mouse again and paste to MS Word or a similar word program. Once you’ve paste it onto the page, you can delete what you don’t want, keep what you do. Most ads won’t show. Make pictures smaller or larger, same with the print. I have a Crafts file on my home computer and the directions can be sent to my tablet via email or download. I don’t need to print, but if I want to, I only have what I want. The best part is that I don’t have to be concerned about weird download software or having problems with my printer. This is GORGEOUS! What a lovely pattern. Thank you…I can’t wait to work on this for winter!! Thanks Victoria! So happy you think you’d like to make it this winter! The ultimate in cozy! Just love so much. Can it be made with ti strands of ww yarn ? I’d say probably 3 strands most likely…. Do you ever do video tutorials on uour patterns? I’m newly converted but I have no idea on reading instructions… much more a visual learner…. so love this tho and would love to make it. Occasionally I do. 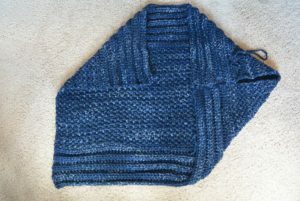 There is a link to a tutorial for the stitch that’s used mostly in this pattern. You can find it above. It’s easy if you get the stitch down because you’re just making a rectangle. 🙂 I hear ya – I’m a visual learner too! What size button did you use? Looks like maybe 1-1/2 inch? Beautiful pattern and it looks soooo cozy! I love working with this yarn too. Looks so comfortable! Love it! Thank you! It is really comfy! I’m looking forward to making this for my mother for Christmas. I’d like to make one for my little granddaughter who is almost 2; thoughts on altering the pattern to a child size? Love the pattern!! I want to make one for my daughter & myself & was thinking of using the Scarfie yarn for this. Do you think it would work since it’s only a bulky weight, not super bulky? Thank you. You’d probably need to hold two strands of Scarfie together to get close or equal the one strand of super bulky yarn….but it’s a great idea! What a lovely pattern! 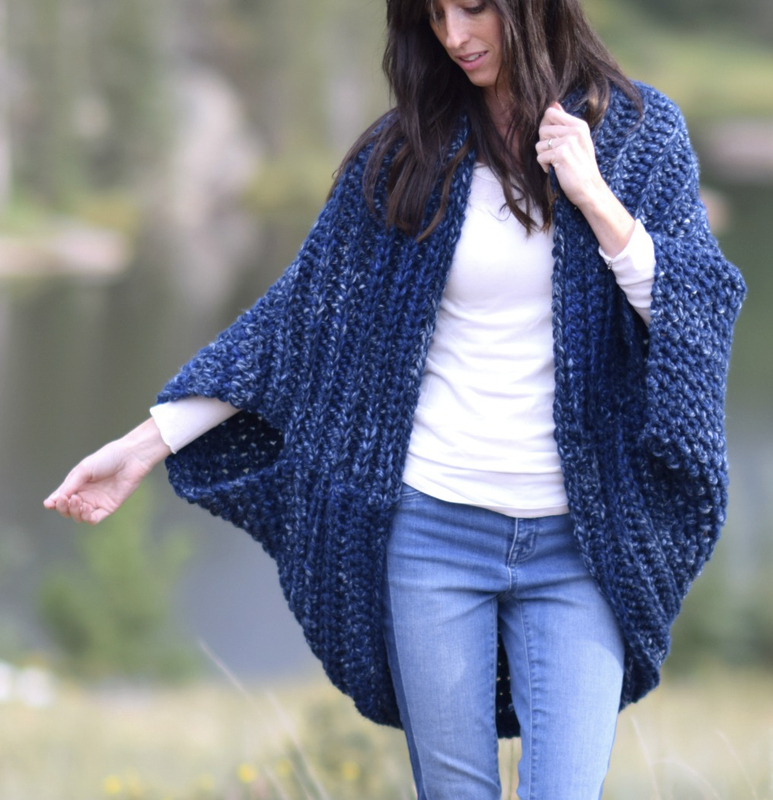 I’d like to know the size of the square needed for the cardigan… I can’t find that kind of yarn here where I live, so I’ll try with some other thickness. In Row 1 it say to Sl St into the stitches, but in your video example it was a SC for the 1st row. Is this an error in the pattern or do I actually Sl St into each chain (minus the 1st chain)? I love this but don’t crochet. Can the pattern be converted to loom knitting? Would anyone know were I can buy one of these??? Hi, I love the look of your cozy blanket sweater! I haven’t crocheted in years but am looking to get back into it with your pattern. I’m allergic to wool. Can you please recommend another yarn for me to purchase? You can choose any super bulky yarn that you’d like. Lion Brand has a 100% acrylic super bulky yarn called Hometown USA that can work! LOVE this! Question…does sk in row 11 directions mean skip? Amei!! lindo o modelo,vc tem a receita dele em tricô? não sei fazer fazer crochê. Hi, I would love to make this for myself. 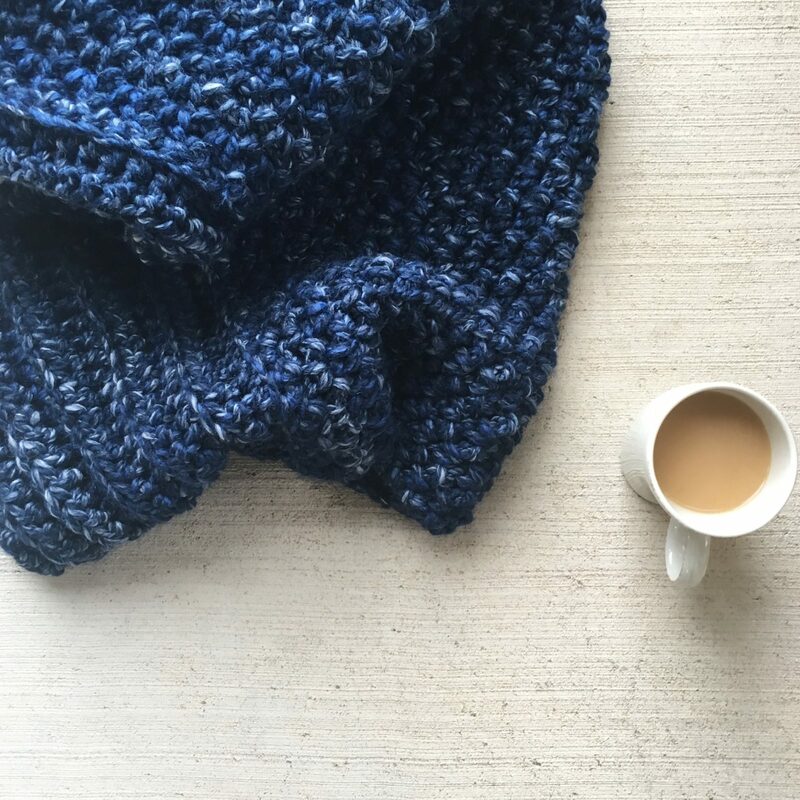 What is the length and width of your finished blanket? I’m only 4’11”. Would I be drowning in it? =D Thanks. I’d stick with the same length of chain, but just crochet for fewer rows. That would be my advice! But it also depends how small you want it…. Hi Tracy! So glad you like it! I’m no expert on specific sizing, but you can start with a slightly shorter chain and crochet for fewer rows. Simply keep an odd stitch count. Hi, I adore this one! Because of my hands (Parkinsons) I cannot make it this way. I would like to try with a existing blanket on my sewing machine. Do you have sizes (in cm) to use as a guideline to work with? This one is 40″ X 32″….hope you can work something out! Hi Sharon! It should be about 40″ X 32. You’ll find all of sizing/dimensions above. I definitely recommend measuring after several rows to make sure it’s turning out the correct size. 🙂 Everyone crochets slightly tighter or looser so it can vary. I can’t wait till mine’s done! But I’m stuck on Row 11/12. I referred to your Simple Mesh pattern, but am still having troubles. Maybe I’m doing Row 11 wrong, or maybe I’m doing Row 12 wrong. If I’m reading right, is Row 11 on the Cozy Blanket Cardigan the same as Row 2 on the Simple Mesh? I’m ending up with about 108 stitches….and it says I should have 76 still…. I’m so confused and I’ve tried going over it and over it for a few days. Hi! Will this kit still be available until Christmas? Christmas being 12/25/2017? Do you think it would Ben party possible to make it have longer sleeves or would it look weird? Also, if I wanted to make this for a 4 year old, about how big do you think I should make the initial rectangle? If I wanted to make this bigger would I just chain longer and do extra rows? I wear and xl and want it to be nice and comfy and oversized. Do you have a recommendation on how many chains and rows to add? I cannot wait to make this, so beautiful and thank you for sharing! I am wondering…how might you adjust this if I were to use Woolease Tonal? I have A TON of skeins of this in various but complimentary colors and love the feel if it, but it’s a 5 not a 6? Perhaps use an 8 instead of a 10 hook and just crochet to size? Your thoughts are appreciated! Yes! Or you can try to hold two strands together to equal the “thickness” of the super bulky yarn. Or, if you’re experienced, adjust your initial chain to the correct size and follow the stitch pattern. Love this pattern, thank you for sharing it. I’m allergic to wool and would like to make one for my daughter. She loves the way Bernat Blanket feels. Would that work for this? You’re welcome Robin! I’m happy to share. I believe it would work out! Any super bulky yarn can substitute for the yarn in the pattern. Thanks for your reply, I appreciate it! Purchased yarn today, so will start working this into my other projects. Row 67. When I do the 2sc in each ch 2 space. I only come up with 50 stitches. What am I missing. I dont understand size ! How can it just be 32 inches long? 13 thru 66 is 53 rows, a lot longer! Help! I think that was a mistake. I ended up adding the same amount of rows as I did for the first ribbed pattern rows and it fit perfect! I am a little confused on the measurements, I checked and double checked my gauge. 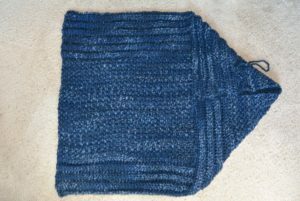 My stitch count is correct and I am using the same exact yarn, but by the time I got to Row 60 I was already way over the 32″ for length and my width is at 32″, not 40. I am not sure what I did wrong…..
That’s a bummer! Gauge can sure be tough, and I really don’t know what could have happened Cindy. If you email me a photo I might better be able to see what is happening. I try to remind folks to measure before they get to the end in case there needs to be adjustments or there’s an error that needs corrected but it’s definitely hard to do sometimes! But if you used the very same hook size, same yarn and chained the correct amount the only difference is most likely our gauge. I’m working on this blanket cardigan now, and wonder what method you used to join a new ball of yarn. Since it’s so bulky, there has to be a secure, but not visible way to do it. Hi Jacqui! I like to join new yarn at the end of a row. I actually do still put a knot in mine most of the time and don’t find it to be really visible. But some folks just simply leave a long enough tail to weave in ends really tightly and that works for them. I love this pattern. I have just started knitting and this pattern was easy enough for me to follow. I plan on making another one with just a single ball of yarn instead of double so it’s not so heavy. I just hope the yarn relaxes a little, it’s a bit stiff right now. The color I used was Graphite, its a beautiful color! So happy to hear it was easy enough for you to follow! Thank you for another stunning project. great pattern! i am 6′ tall – should i make an adjustment to the pattern because of my height (and long arms)? thank you!! Yes, I’d crochet for more rows/inches and start with a slightly longer chain. In Row 1 it says to Sl St into the stitches. Is this right or should it be SC for the 1st row? I have tried the slip stitch and it doesn’t look right, it comes out to thick. Love the sweater. thank you. You can do it either way Maria! I slip stitched, but sc would be fine also. My gauge is one inch per two stitches and I only have row 67 and 68 left. The problem is that it measures 32×32. Also question on row 67, if I make 2 sc in each chain won’t I end up with 144 stitches? Can you further explain row 67?? That’s too bad. It seems your gauge is tighter than mine. It’s really best to measure the width before you get to the very end to ensure it’s turning out correctly but that’s of no help now. If you make two stitches in each ch 2 space, that is 1 sc for each ch stitch. I love this pattern!! Is there any way that I could make it with a 3 “weight” yarn? You can! Just add a whole lot of stitches to the initial chain and crochet for many more rows!! Or you can hold like 4-5 strands together to equal the super bulky yarn. Hi! Loving this! I’m using a lighter weight yarn, it looks great but I’ve found my lace is a bit scrunched up! Can I block off and then fold and assemble? It sounds like you should be able to block and assemble. Hope it works out for you! I love this pattern and will be using your knitting instructions, however, I would like to knit this with Bernat Blanket Yarn. What would you suggest as far as adjustments for this yarn. You used a double strand of #5, this yarn is a #6. I am making these for my 2 daughters and 2 daughter- in-laws and also have resized it with smaller hook size and fewer stitches for my granddaughters. It’s been fun to see them pile up in the wide array of colors. I have been using two strands of 4-ply yarn—“I Love This Yarn” from Hobby Lobby. Lion Brand yarn is hard to find in this area. Wonderful! They sound beautiful and what lucky grandkids and daughters you have! That’s awesome that you were able to adapt the pattern for the yarn. Thanks for sharing! On row 11 it say: Row 11 ch 2, turn, sk st below, sl st etc…What is “sk st” is that skip the stitch below or was it a typo and supposed to be slip stitch below? I’m lost. Could you help me please?!? Thank you in advance!! Hi Emily – so you chain two, skip a stitch below and then slip stitch into the next. Hope this helps and makes sense! I consider myself a slow crocheter, and this project worked up really fast for me. It still took me about 2 weeks but that is only because I dont get a lot of time to work on things like this. I love this project, I just wish it had fit me when I got done. Even though I made sure to have a loose tension, it only measures 32 inches x 32 inches when I got done. If I make this again, how can I make sure I get it the right size? You can always start with a slightly longer chain. This way it will be wider (measure how many stitches you would need to add in order for it to be the width that you’d like and add that to the chain keeping the appropriate stitch count). Then simply crochet for more rows to make it longer. Mine is measuring about 38.5″ across. Is that close enough to 40″? I’m a few rows in and don’t want to undo everything if I don’t have to! Hi Jenna! In my opinion, that’s close enough. It will be a tad shorter at the arms but that’s okay if you’re okay with it. Hope you love how it turns out! Loving this sweater so far. But I’m lost on row 68, how am I to hdc blow in the stitxh in the row below? My row below, 67, is a row of sc. I don’t see a stitch in the back to use. I’m so glad that you’re liking it! 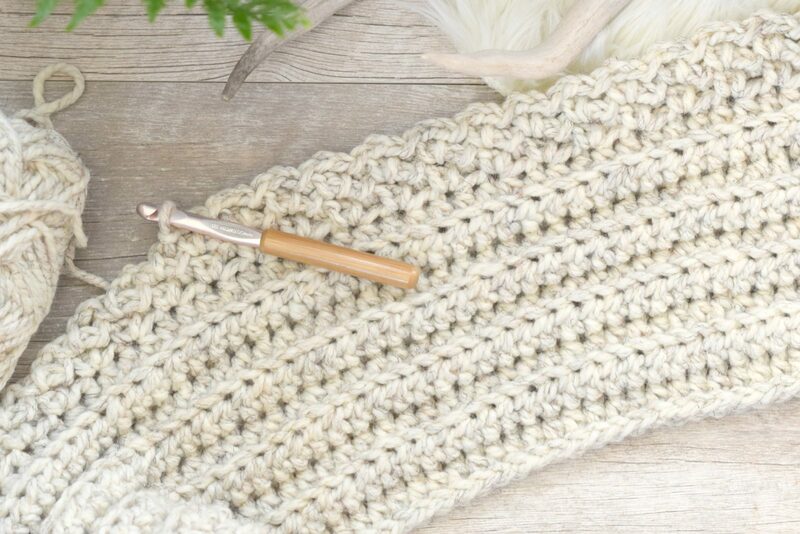 You can crochet through the back of a single crochet stitch. A simple search in google might help you – or even in YouTube! You work through the back loop only rather than under both loops (like you normally would) Hope this helps! I had the same issue with row 11, but I quickly figured out not to turn each time. Slight mistake in the pattern. Yes, it would be lovely in a lighter yarn. Definitely start with more chains to get it to be the correct width and you will also crochet for more rows. Good luck! Lovely looking sweater! 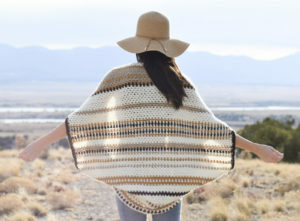 Quick question, do you have any ideas or a simple pattern to add a bit of a sleeve to this blanket sweater? Even one from a different pattern that would work?? Thanks look forward to hearing from you soon!! Can’t wait to finish it! Yes, you can add sleeves by attaching yarn to the armholes and working in the round. Or crochet a flat piece and seam it to the arm holes. Good luck! 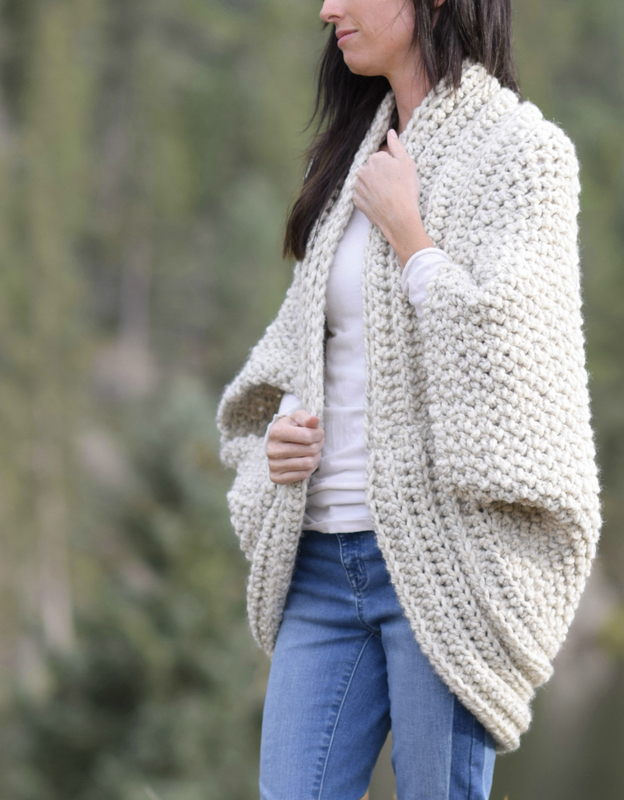 I did a quick google search for cocoon sweater crochet pattern and got several with sleeves, one of these may work. My first time to write and of course I have a question. I have been looking at this cool sweater since before Christmas. I have read the whole thing and instructions several times and can’t figure out why the wheat colored one takes less skeins than the river run one. Should I choose another color yarn than either of the 2 mentioned would it take the same amount of yarn as the river run one or the wheat one? Thanks for you help. Hi! The skeins of River Run have less yardage than the skeins of Wheat. So just make sure you purchase the correct yardage if substituting yarns. I crocheted mine in 2 days. I made it a little bigger and it came out beautifully but it slips off my shoulders. I don’t like how it looks buttoned. Yours doesn’t slide at all??? This is exactly why I often love to use the button. This particular one doesn’t slide on me like the others, but I know exactly what you’re talking about. The only solution I’ve found is to do some sort of tie or button in the front. I bought your kit for The Cozy Blanket Cardi and love how it is working up; really enjoying the process! I need to make one larger to fit bust measurement of 36-inch and hips of 41-inches. How many more chains would you suggest adding? What size would you suggest I make it? And how many more skeins would you suggest I buy? That’s so awesome that you bought the kit and that you’re enjoying it so far. Thanks for reaching out to me! My suggestion is to add a couple of chain stitches for every inch you’d like it wider (without knowing your tension this is my best guess). Since this is a one size fits most, I’m not completely sure how many chains to tell you to increase for your size. However, you will certainly need more yarn and I would guess two to three skeins depending on how much larger you go. As you make it wider, you will also need to make it longer to keep the proportion. Really appreciate the info and looking forward to working my second one up a bit larger. Hi Lisa! You’re welcome! I hope that it works out for you! I know how difficult it can be trying to get things to be just the right size for ourselves. I wish this one was for me! It is a gift for my mother-in-law and she lives a bit to far for me to size as I go. I purchased a dozen skeins of the same yarn to make hers and will go a bit Larger for her to snuggle up in her Cozy Blanket Cardi. She’ll even get a hat to go with it! Thank you for all of your help, along with sharing all of your lovely patterns! I have a list of them to work up and even have a few to work up for myself! I have a question on the cozy blanket cardigan pattern row 67. Love the cardi patterns all of them the temp here last night was – 10 not including wind chill which I don’t even want to know what that temp was so today I put up the baby blanket I was working and started this pattern it’s so quick and easy I want something warm to put on it’s freezing I should be done in a week as fast as it’s working up thanks. And for the ones that don’t like the ads I screenshot the pattern or in this case several I can crop anything in that out and work on anywhere if I can’t connect to your website. Also I have the pattern later to make again. Idk if your site has a place to post pic but I’m definitely pinning and google+ to direct everyone to your website thanks again! Thank you so much for sharing it Deanna! It means a lot to me. Sounds like it’s pretty cold where you are! I completed mine and love it!! However, My 10 year old girl has requested one of these. Any suggestions on how to downsize the pattern? Or do you ha e a similar pattern for a little girl? Thanks! Hi Sara! I’m so glad that she likes it and you are happy with it too! Simply start with a shorter chain – the chain will be similar to the length from end of arm to end of arm. So you can take a good guess at it that way. I loved working this up! I was thinking it was too “chic” or young looking for me (65 yr old), but have had tons of compliments. Two friends want the pattern, one wants me to make her one. I will need to make it bigger, just adding more chain length I assume. Do I need to add in multiples of …(? any particular number)? Will making it longer still be ok for the arm holes? Won’t get out of size? Hi Connie! So glad that you like it! Yes keep an odd stitch count and if you make it wider, you should also make it a bit longer to keep similar proportions to the pattern. Just found your site about a week ago and am halfway through making the lovely blanket cardigan! I’m using the Hudson Bay colour blend Wool Ease Thick and Quick and it’s going to be beautiful! I also have the blue River Run colour in the wings for my second one! Thank you so much for such a cosy and gorgeous easy to make sweater! I am excited to explore more of your beautiful patterns once I’m finished the two sweaters! I LOVE the Hudson Bay color!! I bet it’s gorgeous! So glad you found me and thanks for your kind words! Adorable pattern! I can’t wait to try this. Thanks for sharing each step briefly to make this. Made this cozy blanket cardigan. Used different yarn and hook size. The yarn was Charisma by Loops and Threads. I adjusted chains and rows to match sizing info…..Love it, although I’m a 1x kinda gal and not as flowing as on you…..good thing I used yarn from my stash. Going to try and make it bigger length is good but width not as comfy. Thank you for the pattern! Thanks for the feedback and info Deb! 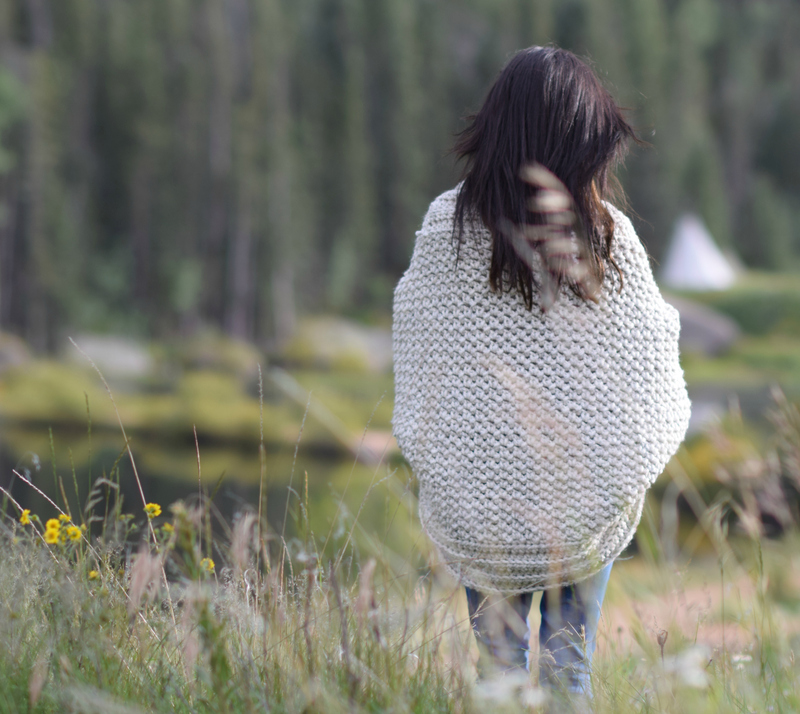 Oh how I wish your cardigan, poncho and all other top patterns had child sizes available. My nieces would love this and a lot of your other patterns. I think I’ll try this with a lighter yarn and smaller hook. o los puntos como se hacen ? Beautiful sweater, and very easy pattern. I crocheted one last winter, and it’s awesome, but it won’t stay on my shoulders because the yarn is so heavy. It keeps slipping off. If I use the button, it just pops out. It doesn’t look like the model in your pictures is using the button anyway. Do you have this problem? Any suggestions? I want to try this pattern, but the last time I used Thick n Quick, the yarn pilled up after only about a month. Have any suggestions for another yarn I could use? I need help with row 12. I’ve watched the video tutorial and I understand the mesh stitch but the beginning of row 12 states “sl st into chain 2 space below.” I don’t know where the chain 2 space is. I chained 2 and turned so I have chain 2. Is the space the bottom of the chain 2? Making this sweater for my daughter and then I want to make one for myself! Never mind! I wasn’t doing row 11 correctly so that messed with my row 12. Think I’ve got it now! I’m so excited for this but I’m a little confused. The pattern at 77 stitches does not look as big as the cream coloured picture. Will the exact pattern make the same size as picture? Hi! Everyone crochet differently – I’m a loose crocheter. To make sure you’re right, you’ll need to check gauge or measure a few rows in. I just finished this pattern and I need to stitch the arms. Can I assume you turned the piece inside out before stitching? I tried to message you a questiin on both facebook messaging as well as instagram about the pattern and haven’t received a response. I attached pics on the instagram so you can see where I am having teouble. Can you please take a look? I would greatly appreciate it. I’m @wardo1985 on instagram. How I love this pattern! And this blog. The new stitches and the creativity are such an inspiration. Can’t wait to start! JUST BOUGHT this fabulous blue kit on sale at Lion Brand. Jessica, thank you for all of your beautiful and fast patterns. I am a huge fan. Ahh! I hope you love it Brenda! Let me know if you have any questions!! Happy New Year and thank you so much for your sweet words!